Log A Champion Fighter. Battling him requires a certain level of artistry. "You wanna hate me, but you can't help but love the RAAAAAAAWWWWK!" That's Rawk Hawk! He flips, flaps, and slaps! ...That's what the book says. Max HP is 40, Attack is 3, and Defense is 1. He's really good at aerial maneuvers, but other than that, he's pretty... meh. One thing you should know is that Rawk Hawk NEVER fights above the board. Carelessness leads to lifelessness, y'know! Rawk Hawk, also known as the "Feral Nuclear Reactor", is the reigning champion in the Glitz Pit in Paper Mario: The Thousand-Year Door, until Mario arrives to take his title. Mario does this in order to obtain the Gold Star, which is supposedly found on the Champ's Belt, which only the champion is allowed to wear. Prior to Mario's arrival, Rawk Hawk joined the Glitz Pit, achieved higher ranks and eventually became champion. However, he became champion only by default, since his rival, Prince Mush mysteriously disappeared before their title match could begin. Rawk Hawk standing next to Grubba, and holding the fake Gold Star on the Champ's Belt. Rawk Hawk appears in the third chapter, Of Glitz and Glory of Glitzville. When Mario and his partners arrive, they find Rawk Hawk squaring off against The Koopinator, whom he manages to defeat easily. Grubba, the Glitz Pit promoter (and referee) congratulates Rawk Hawk for his victory. Rawk Hawk then holds up the Champ's Belt, which gets the attention of Mario and his partners. Shortly afterwards, Mario and his partners decide to become official fighters in the Glitz Pit in order to win the championship and obtain the Crystal Star. When Mario and his partners make their way into the major league, however, the Crystal Star in Rawk Hawk's belt is revealed to be a fake. 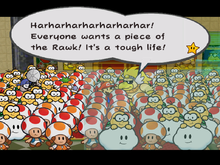 As Mario and his partners continue climbing their way up the ranks, the audience begins to take their attention away from Rawk Hawk and starts to focus on Mario and his party. Rawk Hawk, jealous, threatens them, though they continue to ignore threats. Rawk Hawk then sends Mario and his partners a poisoned cake (after they have received a real cake), which can cause Mario's partner to fall sick and thus not participate the next round. Mario and Goombella preparing to fight Rawk Hawk. Eventually, Mario and his partners challenge Rawk Hawk in a title match. Rawk Hawk, afraid of losing his title, decides to cheat again by having a security guard lock Mario and his partners in an abandoned minor league locker room, which would cause them to forfeit the match. However, they escape by using a toilet, and eventually confront Rawk Hawk. When the match begins, Rawk Hawk reveals himself to be responsible for the several setbacks, so they accuse him of sending that threat about the Crystal Star as well. Rawk Hawk, however, was not the one who was sending them the threatening letters, nor did he care about or was even aware of the existence of the Crystal Star. Mario and his partners then usurp Rawk Hawk's champion status. The group is then awarded with the Champ's Belt, as well as access to the Champion's Room. Mario using the Power Bounce technique on Rawk Hawk. After Macho Grubba's defeat, many of the Glitz Pit fighters, including Rawk Hawk, line up to say goodbye to Mario and his partners before they left to continue their adventure. Rawk Hawk then told Mario that he will fight fairly from then on. During the intermission after Chapter 6, Bowser and Kammy Koopa finds Rawk Hawk's secret training area, which is located somewhere underneath Rogueport. When they arrive, they see the Champ's Belt hanging up on the wall and mistake it for the real Crystal Star. Just when they are about to grab it, however, Rawk Hawk comes and fights Bowser. This causes the false Crystal Star on the belt to break into two. Kammy realizes that the Star is a fake and questions Rawk Hawk about the real Star's whereabouts. Rawk Hawk tells them that "The Great Gonzales" has it, but Bowser fails to realize that "The Great Gonzales" is Mario. During the seventh chapter, Rawk Hawk sent Mario an e-mail saying that he has not forgotten about their last battle and that he "feels the rage all over again" on rainy days. He then calls him a coward for giving up the belt and threatens him, saying that if he ever comes back, he will get "Rawked". Rawk Hawk reappears during the cutscene that takes place during Mario's final battle with the Shadow Queen. He, Jolene, and all the other Glitz Pit fighters began cheering Mario on, encouraging him and his partners to defeat the Shadow Queen and save the world. After Chapter 3, the player can optionally choose to return to the Glitz Pit, where Rawk Hawk is once again the reigning champion (since Mario hands the belt back to him before he left the first time). This makes him the only rematchable boss in the game. In Super Paper Mario, one of the items listed on Francis's to-buy list is Harder Than Bedrawk: The Rawk Hawk Story, which is, apparently, a DVD detailing Rawk Hawk's wrestling career. Rawk Hawk also makes a cameo appearance in Super Smash Bros. Brawl as one of the many Stickers. In addition, one of the names that may come up on the name or stage builder entry when the random button is hit is "RAWK", a reference to Rawk Hawk. A clear demonstration of Rawk Hawk's arrogant attitude. Rawk Hawk, throughout the course of the game, has proven himself to be extremely arrogant, egotistical, and self-centered. He constantly bragged about his skill, and looked down on the other Glitz Pit fighters, labeling everyone else around him as complete wimps. Up until Mario and his partners showed up at the Glitz Pit and made their way up the ranks, he was a hundred percent convinced that no one could defeat him. Rawk Hawk is also willing to cheat if necessary in order to win. This was shown when he had a security guard lock Mario and his partners in an old, abandoned minor league locker room before the title match started, as well as sending Mario that poisoned cake, while he honestly denied knowledge about Grubba's hate mail and the real Crystal Star. 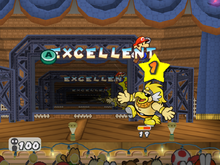 However, after Mario defeated him in battle, Rawk Hawk ended up gaining a lot of respect for him as a fighter (as he demonstrated during the Crystal Star intermission cutscene that took place during the final battle, but even then he was still showing a display of arrogance), and made a decision to fight fair and square, and to never cheat again. He also gets enraged whenever people imply that he is weak, as one of the reasons why he wanted to beat Mario no matter the cost was because he felt insulted when he heard them apparently imply that his belt was fake (although they were actually referring to the Gold Star on the belt), and also attempted to do a high kick suplex on Bowser after the latter mockingly called him an "adorable little weakling." (although he ended up being flattened by Bowser). Rawk Hawk performs one of his aerial attacks. As it says in his Tattle information, Rawk Hawk mainly specializes in aerial attacks. His attacks consist of a jumping flip attack, a flying elbow attack, and his only ground-based attack, which is a slide kick. For his last attack, he'll stomp the ground (which causes a rail to appear), hang on to the ceiling, and start shaking down a bunch of objects very quickly, which all deal 1 HP to Mario and his party. Koops, on the other hand, is immune to this. Spanish Hawk Hogan Pun on "Hulk Hogan", the ring name of an American professional wrestler. French Gold Hawk Like the Japanese name. German Aurelius Male form of the Roman gens name Aurelii, meaning "the golden". Ningen Genshiryoku Hatsudensho "The Human Nuclear Reactor"
Judging from his attacks, Rawk Hawk seems to use the Lucha Libre method of wrestling, involving flashy acrobatic moves. In terms of wrestling, he is also considered to be a heel, a villainous wrestler who uses dirty, underhanded methods to win, regardless of popular opinion. In the Spanish version, after defeating The Koopinator, Rawk Hawk says "The weaklings should stay home playing Super Smash Bros. Melee!". In all other versions of the game, "Super Smash Bros. Melee" is simply replaced with "video games". When Rawk Hawk wins the match against Mario, the normal winning tune plays when the match is over rather than the tune that plays when a fighter claims the champion ship belt. When Rawk Hawk appears before Mario in the hallway during Chapter 3, if the player is quick enough to skim through the dialog after he leaves the map and head the same direction he went, they can get a quick glance of him disappearing into air. During the Chapter 6 intermission where he meets Bowser, Rawk Hawk expresses his amusement at how Bowser cleared his "secret training facility", stating that he "imported some super-freaks" to make it more difficult to get through. By "super-freaks", Rawk Hawk seems to be alluding to the X-Naut soldiers that Bowser encountered in the level he cleared. This page was last edited on March 14, 2019, at 21:29.